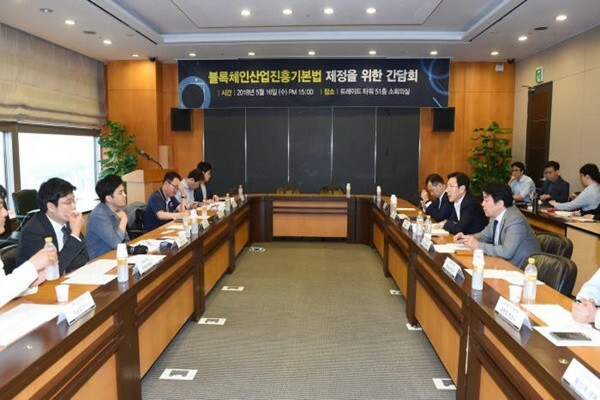 Korea International Trade Association (KITA) held a meeting for ‘Legislation of Blockchain Industry Promotion Fundamental Act’ at Trade Tower in Samsung-dong on the 16th and collected opinions from representatives of various industries. Representatives from blockchain companies, accelerators, universities, and law firms participated in this meeting and they suggested for changes in clauses and urged for swift legislation. Industries agreed that there needs to be enough clauses that also consider investors alongside of blockchain businesses within a legislation bill. They are claiming that it will be difficult to promote blockchain industry until FSC eases its stance towards complete prohibition of ICO. Many attorneys also attended this meeting and shared their opinions about interpretation and correction of detailed clauses with Senior Attorney Kim Kyung-hwan of MINWHO Law Group who wrote legislation bill. “Clauses that approve validation from achievement of conditions of Smart Contract are somewhat unrealistic.” said Cho Won-hee who is an attorney from D’LIGHT Law Group. Opinions about needs for regulations on cryptocurrency exchanges were also brought up.